All endurance runners need time off from training in order to regenerate the body and relax the mind. In most cases this regeneration time follows a vigorous racing schedule and an intense training period. Endurance fitness is elusive because it cannot be maintained over an indefinite length of time. Training adaptations are disruptive to the body and while some fitness components create a “new normal”, others change homeostasis so much that the factors are bound to crash eventually and lead to chronic fatigue. We know from training literature that anaerobic factors require 9-12 weeks of development to reach top fitness and 20-27 weeks to develop the aerobic energy system to a new level. Then what? The answer lies in allowing the body to detrain for a period of time before beginning full-scale workouts again to attempt a reach at an even higher performance level. This train hard—back off—train hard—back off, etc, sequence is what facilitates the route to ultimate fitness for any genome. The training guidelines are set at the weeks given, but how long should the detraining period last? This answer lies in allowing enzyme levels and blood chemistry to recover a bit, but not long enough to witness a deterioration of the structural improvement changes that resulted from training. The essence of extended weeks of aerobic energy system training should produce improvements in the following structural and biochemical components. The last two bullet points on the list are the important ones to consider in why athletes need to take time off from training. The runner should take just enough time off to regenerate those two points without compromising the first six structural points. Humans in general and athletes in particular enjoy activities that exhibit pattern. Once you get your runners in a pattern of running over a season perhaps the last thing you want to do is tell them to stop training. A couple of weeks of not running, and a new activity pattern gets established that may last a whole summer. It is important to educate your team members on why it is important to take time off. Beyond the physical regeneration it will give the athletes’ time to finish ignored errands, go to the beach, and spend time with mom and dad. But then after three to four weeks, it is time to start training again. Why three to four weeks? 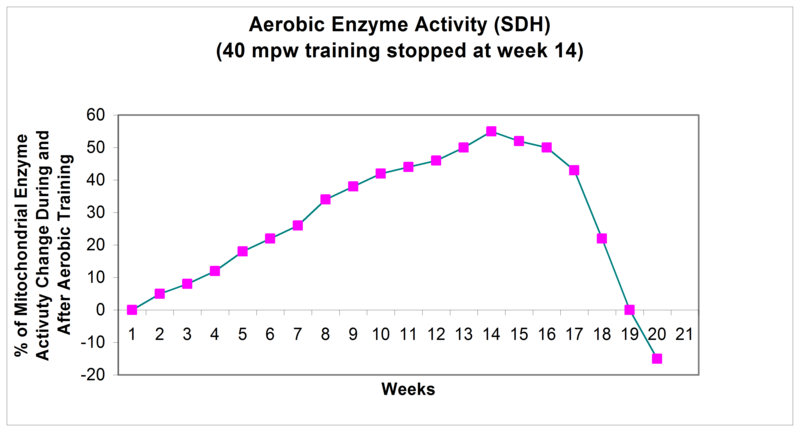 If we follow the evolution of a key aerobic enzyme over a training period we see that its quantity and activity improves in a somewhat linear fashion. However, improvement cannot go on this way forever. Eventually, regeneration must occur. Succinate dehydrogenase (SDH) is one of many enzymes involved in the activities of the aerobic energy system. Predictably, SDH quantity and activity increase in a linear way during aerobic training (Figure 1). In this study (Hargreaves 2013), runners at 40 miles per week of aerobic training ceased running after 14 weeks and the sample of athletes were allowed to detrain from week 14 to week 20. The data points indicate the rapid drop of SDH quantity and activity from weeks 17-20. This is but one of many aerobic structural or biochemical markers that can be used to measure fitness, but in this study of SDH, had the athletes resumed training after three weeks their mean SDH quantity would not have fallen to the extent that it did after six weeks of no running. This study clearly shows that three weeks of no running would be the proper detraining protocol. Taking time off from running is important to robust training. It is up to the coach to decide exactly how much time off should be prescribed. Weigh the physical components with the psychological aspects of the individual and determine the regeneration time period. If you allow the athlete to make these key decisions then you will always be starting over, or you will have an athlete with chronic fatigue. Cross Country Coaches: Want Every Workout from June Through Nationals? Click here! Scott Christensen is the head track coach at Stillwater Area High School in Oak Park Heights, MN. Complete Track and Field, LLC.